Heat oven to 350°F. Grease bottom only of 13x9-inch pan with shortening. In large bowl, stir brownie ingredients until well blended with spoon. Spread in pan. Bake 24 to 26 minutes or until toothpick inserted 2 inches from side of pan comes out almost clean. Cool completely, about 30 minutes. In large bowl, beat filling ingredients until smooth. Spread over cooled brownies. Cover; refrigerate at least 2 hours or until set. To serve, spoon pie filling over top. Cut into squares. 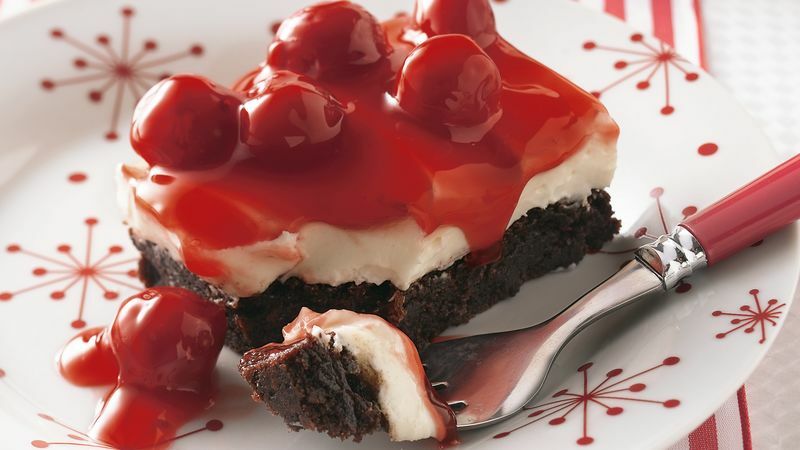 The brownie base of this dessert can be baked, cooled and frozen in the pan. Up to a day before serving it, fill and top the brownies as directed in the recipe. Refrigerate the dessert until serving time. For a pretty presentation, garnish each serving with a dollop of whipped cream and a drizzle of purchased chocolate sauce.